Click on item #14 in the shopping cart to buy this book. After the unfortunate accident which befell Apollo 13 the job of getting NASA back to the moon fell on the shoulders of America's oldest astronaut Alan B. Shepard. Shepard had been grounded since the flight of Freedom 7 in 1961 due to an inner ear disorder. After undergoing treatment the "Icy Commander" was bumped to the top of the flight roster and appointed to command the flight of Apollo 14 to the Fra Mauro highlands of the moon. Spending nearly 10 hours on the moon in February 1971 Shepard and Lunar Module pilot Edgar Mitchell conducted a wide range of scientific experiments including Shepard's unplanned test of the flight of a golf ball in lunar gravity. Once more the world sat and watched in awe as the United States successfully put two more men on the moon's surface while Stuart Roosa orbited above in the Command Module Kitty Hawk. Shepard and Mitchell hiked almost to the top of a 400 foot crater before running out of time and returning to the Lunar Module Antares. Apollo 14 returned to the Earth with a treasure trove of lunar data and over 100 pounds of moon rocks. 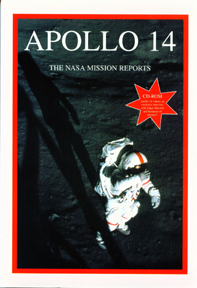 In "Apollo 14 The NASA Mission Reports" some of the rare official documentation of the voyage of Apollo 14 is collected and made commercially available for the first time.